Fiesta Morelense - AS SEEN ON TV!!! First Friday, May 3rd at Momas N Dadas. 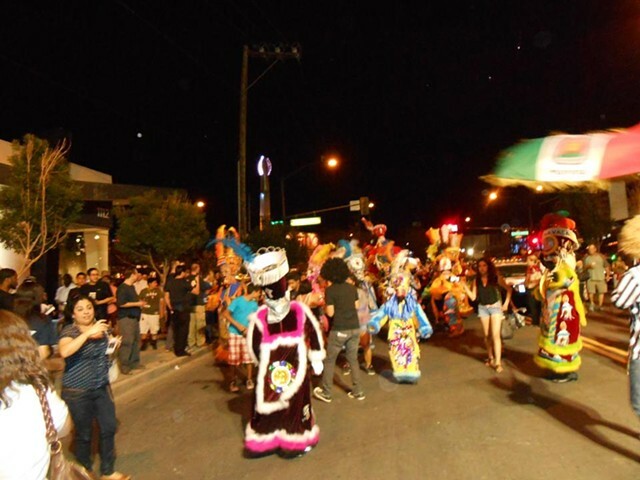 Parade through the LasVegas Arts District, authentic food, cervesa, live music, dancing, DIY Fiesta Morelense attire, and guest speakers discussing the history and heritage of Comparsa! A fantastic start to the Cinco de Mayo weekend! The Chinelo, according to the house of culture of Tlayacapan, it was in 1870 when the group of young natives, tired of being excluded from the carnival, organized a group. They dressed in old clothes, covering their faces with handkerchief and began shouting, whistling and jumping on the streets of the town, mocking the Spanish. This is how it took shape, the character of the “Huehuetzin” nahuatl word meaning “person who dresses in old clothes.” Year after year, as they became more popular, the party was ritualized and gradually evolved character. To represent the Spanish, they added beards to the masks and the name, Chinelo appeared. We also know that the word chinelo comes from the Nahuatl word “tzineloa”, which means “movements of hips.” Some say that the jump of the Chinelos and the travel that the groups made, represented the beginning of the pilgrimage rites of the Aztecs before founding the city of Tenochtitlan. Young people went from village to village-harvesting grain and flowers and catching butterflies, to use as ornaments in their costumes and upon entering each village they began to jump and dance. These actions spread the passage of “the jump”, to the form we know today.